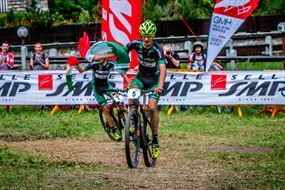 XCO Italian championships, Courmayeur, 12 June 12 2016: The first and second podium position at the Italian XCO 2016 go to Daniele and Luca Braidot on Olympia IRON bikes. The GS Forestale Olympia Vittoria twins ed the race together: Luca in the lead almost immediately was then joined by his brother Daniele, who crossed the finish line in the first position. An excellent 6th place went to the other team member, Mirko Tabacchi. Nicholas Pettinà instead was somewhat unlucky, who without any technical problems he would surely have fought for a place on the podium. A victory for the GS Forestale Olympia Vittoria and a victory for two athletes who this year are proving to have the right condition to achieve important goals: Daniele Braidot wears the Italian tricolour flag, while his twin brother Luca is fresh from having been summoned to participate in the 2016 Rio Olympic Games. On the podium, the Olympia IRON bike, 29" hardtail multiple award-winning with monocoque frame in three different fibres (T1000, M40J and T800s). The bike is equipped with Vittoria wheels with new graphene tyres, Fox forks and shock absorbers, Ritchey and PMP components, SRAM groups. "A great result! It is an enormous satisfaction! Luca was in an excellent condition and the favourite. We knew that Daniele was fine too but we would not have imagined a double win! A result which, added to the national title won by Leo Paez (Team Olympia Polimedical) in Colombia, just a month ago, fills us with pride", commented Marino Pizzo, team coordinator of Cicli Olympia.